Sorry about the lengthy delay in getting this piece out to everyone but hopefully you will enjoy it!! The time that I normally spend writing has been dedicated to my consulting work with the College of Central Florida Patriots who just finished their season at the FCASS tournament. After finishing third in arguably the toughest conference in the NJCAA behind the #1 and #9 ranked teams in the entire country, the Patriots beat out Miami-Dade in a one game playoff to punch their ticket to the state tournament. I wanted to take this opportunity to thank them for all their hard work and giving me the opportunity to help them out despite the fact that I live about 3000 miles away. Stay tuned for a blog post in the near future where I will go into detail about how I worked with the Patriots this year as their remote strength coach. The next physical trait that I want to explore in order to help customize mechanics is deceleration. Deceleration is what I am considering to be eccentric strength. Not everyone knows what eccentric means so I find this term is easy to understand and the simple car analogy of “hitting the brakes” in order to decelerate can help people grasp this idea. The eccentric phase of a muscle contraction is critical but it often gets overlooked by the more popular concentric phase which would be associated with acceleration. Eccentric strength and an athletes ability to decelerate is so important because our capacity to hit the gas pedal to go as fast as possible is going to be limited by the capability of our brakes. You wouldn’t want to drive a car that could go really fast but wasn’t very good at stopping would you? Luckily the human body and brain are designed this way too. Eccentric strength is a topic that I have explored in the past especially when I write about the front leg upon landing. This is where we need a high amount of eccentric strength in order to stabilize that front leg and ultimately transfer that energy up the kinetic chain. Check this post out for more. The front leg is just one example of eccentric strength in the pitching motion but there are countless others because any time you move any parts of your body your will muscles will go through all three phases of a muscle contraction (eccentric, isometric & concentric). Look at this picture below for a quick refresher about these 3 phases. My goal here is to explain what an eccentric contraction is and how it plays into mechanics and training. The race car analogy I am going to use this time is a windup race car that you might of had when you were young. You pulled the car back as you loaded (aka eccentric) up the spring before unloading (aka concentric) the spring by releasing the car to see how fast and far it could go. Because the car can go further and faster the more you pull it back makes it an ideal analogy since muscles work this way too. 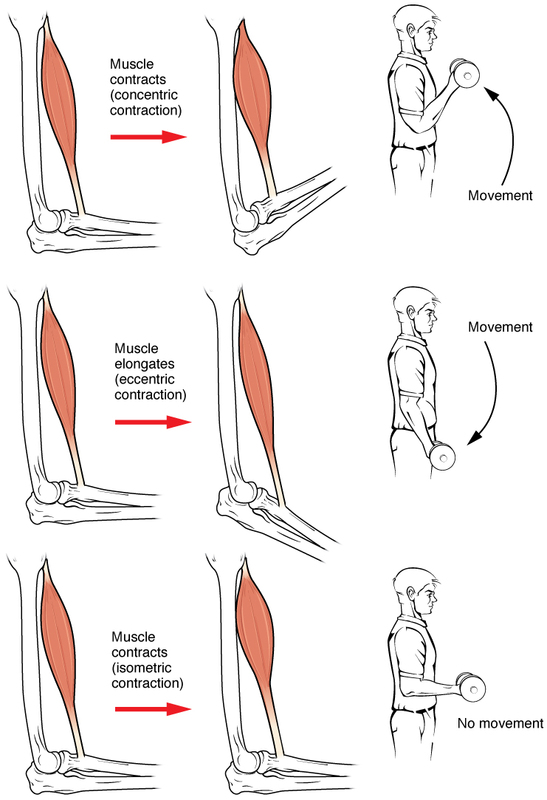 Here are some examples of body parts and muscles during their specific phase of the “Windup” and the eccentric contractions that go with them. All three of these guys (Chapman, Ryan and Scherzer) throw really hard and they all load the back leg with their own combination of sitting back into their hip and bending their knee. I’ve cut each video off right before they start to unload and I really like the older video of Mr. Ryan because it is paused which really gives you an appreciation for the amount that he loads that that back leg. Here we see Sonny Gray, Tim Linsecum and Johnny Cueto all “windup” their hips to varying degrees. The amount that you load the hips and how long you keep them loaded as you make your way down the mound will play a huge role in determining how much rotational power you develop from the lower half. It also adds style and deception, right Mr. Cueto?? Here I just have Mr.Chapman displaying a nice stretch across his chest which can be achieved actively using a scap load. By contracting the back muscles to produce a scap load you automatically make the muscles that oppose it, in the case the chest, to stretch. Here I have Zack Grienke showing us how he winds up his internal rotators of his throwing arm by having his forearm “lay-back” into external rotation. This eccentric load is a bit more passive in the sense that it is caused by the whole body moving the arm so fast that it cause the hand and forearm to fly backwards before “bouncing” back and unloading. While I really love the “Windup Car” analogy I do feel the need to clear up one real key point that differs between how you load a toy race car with a metal spring versus a live human muscle. In the toy car example it is understood that pulling the car back further is a good thing. But if you pull the car back quickly would it go faster compared to slowly bringing it back to the same distance before releasing? While I haven’t done this actual research project I think it is safe say that there isn’t much different between to the two loading speeds for this metal spring. When we look at real human muscles however it is important to know that the speed muscles are loaded is very important in regards to the speed they are unloaded. The importance lies in the fact that athletic movements like jumping, sprinting, kicking and throwing are all very fast actions that happen in less than 250 milliseconds. If it takes you too long to load your muscles you will miss this small window and lose out to players that can produce force at a faster rate. This is an important concept in exercise science called rate of force development or RFD. Producing force quickly is easy to understand but the rate of force acceptance (RFA) is equally important from a performance perceptive and even more important from an injury prevention perspective. To get a visual on this I am going reference the cover of coach Cal Dietz’s book called “Triphasic Training”. Coach Dietz works at the University of Minnesota and literally wrote the book on eccentric training. The “Tri”refers to the three phases (eccentric, isometric and concentric) that each athlete goes through in every sport. The “V” you see on the cover is the what you get when you graph the amount force an athlete can produce (vertical axis) over time (horizontal axis). The line going down on the left side is eccentric portion while the line on the right coming back up is the concentric phase. The bottom part of the “V” where the two lines meet would be the isometric phase. Ideally you want to have a steep angle coming in as well as going back up with a sharp peak at the bottom. In his book Coach Dietz talks about two athlete’s, Ben and Tommy, who can both produce the same amount of force in the weight room yet on the field (track and field throwers) Ben outperforms Tommy every time. The reason for which is because Ben’s “V” is much sharper which means that he can accept and then produces force at a faster rate than Tommy. Some players might not go down as far but the steepness of their “V” is what saves them because that is what represents speed. Think back to the way I described Aaron Sanchez and his loading of his back leg. While other have a deeper “V” but the angle isn’t as sharp, this time think of Stroman. Every player has to develop their own recipe for how far and how fast they load their muscles. This is where we need to individualize mechanics based on their eccentric strength levels. We can make the athlete stronger so they can handle higher forces but that doesn’t happen over night so in the mean time we have to adapt to the athlete we have in front of use today. It’s been noted that taller and heavier young pitchers are more likely to get injured then their smaller teammates and I think a lot of this could be a result of not being strong enough eccentrically to handle these higher forces that the extra length and mass creates. Maybe a less aggressive stride length would suit these young pitchers as they grow into their bodies and eventually their mechanics. I’ve learnt in dealing with younger pitchers that getting them to glide into their front foot hitting the ground with what I call “landing like a jet” allows them to hit the ground with less force and increase the chance of their front leg being able to stabilize and maybe extend rather and continue to flex as gravity takes over. This is something that I said in my free webinar about how to “Use Your Legs” when you pitch. As a result of this video I was called by a MiLB pitching coach to talk shop and during this conversation I began to realize that with high level throwers it is a completely different ball game, pardon the pun. With some high level throwers this might be different because they are strong enough to handle “landing like a helicopter” and then benefiting from these higher forces that can allow them have a sharper and deeper “V”. Really any test we put an athlete through has some eccentric information for us to record and observe. Popular tests which we use to see how much force an athlete can produce like the 60 yard dash or the vertical jump first require force absorption with eccentric strength. By closely watching the eccentric portion of a vertical jump when athlete load their knees, hips and ankles before getting off the ground can provide some clues. Do they load and unload quickly? Is there wasted movement? When they run each time their foot hits the ground they are absorbing a lot of force which they need to accept then quickly unload in order to keep going. Watch everyone run and watch for breakdowns in their posture to see if they are “sitting down” when they run which means that they are losing energy. There are however some tests that emphasize eccentric strength and here are some of my favorite for the lower body. Hop and Stop: this is a test that was developed to help provide some insight into when an athlete was ready to return to play after injuring their knee which again points out how important eccentric strength is in regards to injury prevention. It requires the athlete to jump off of one leg as far as possible then come to a COMPLETE stop in under a second while only landing on their other leg. Pro-agility: watching how athletes go into and out of the changes of direction can tell you a lot about the eccentric strength that an athlete possess. Ideally you want to run as fast as you can then SLAM on the brakes before changing direction and re-accelerating. If you see an athlete “gliding” into the turns then this could be that they inherently know that they don’t have the strength needed to stop effectively. Or you might see players that do go hard into the turns but look really sloppy and can’t maintain athletic postures. Check out this video posted by Cal Dietz to see what I am talking about. Triple Broad Jump: this one requires huge amounts of eccentric strength to handle the forces between jumps. By looking at the ratio of between the 3 jump average on this test and the athletes score on the standard broad jump can be provide some valuable insight. I won’t get into this too much here since it is worthy of an entire book and if you are interested I would suggest Cal Dietz’s book. Again you get eccentric training every time you perform a rep in the gym when you lower a weight. And by the way this is the most important phase in regards to getting bigger (aka hypertrophy) so if this is a goal then be sure to control the weight down rather than letting gravity do all the work. If you’ve ever seen anyone train with eccentrics in the gym it was probably something like this with guys doing “negatives” with high amounts of weight. These super heavy weights are possible since we are stronger eccentrically then we are concentrically. But if your goal is to be really fast and athletic then lowering these super heavy loads slowly isn’t very specific to your sport and thus shouldn’t be your main form of eccentric training. To create these specific speeds to reap the on-field benefits of our training we need to think outside the traditional box of weight training. Here is a very expensive way to help increase your eccentric strength. Exxentics created this piece of a equipment called the K-box that uses a Fly Wheel to pull you back down to earth with more force that you put into the ground thus causing the overload we need to increase performance. This machine is becoming more popular with pro teams because they see the value and they have the budget. In fact the only I have seen a K-box was in an MLB spring training facility. A much cheaper way that might not get the exact same benefits would be a kettlebell and a band. If you know how to swing a kettlebell this can be a great way to get some over-speed eccentric training. I can’t stress enough that you need to know how to swing a kettlebell. Get some professional help and they can even provide the overload once you have mastered this movement. I’ve also introduced some jumps that place an emphasis on the specific types of eccentric strength that we need from each one of our legs when we throw. **The first guy is a right handed while the bottom guy is a lefty which is why they are both landing on their right leg. These are just a few examples of some training methods for the lower body that can help if you have an athlete in need of eccentric strength. Next we will explore elastic energy while touching on isometric strength to see how well athletes transition from eccentric to concentric. Thanks for your time and attention!! The gym where I work puts on a great seminar and this year we have Cal Dietz presenting along with Dr. Rob Butler who played a major role in helping rehab Marcus Stroman at Duke and is now the Director for Sports Performance with the St. Louis Cardinals. Check it out here and if you are interested in coming up to Kelowna BC let me know. Remote Coaching – What is it and Will it Work for You?